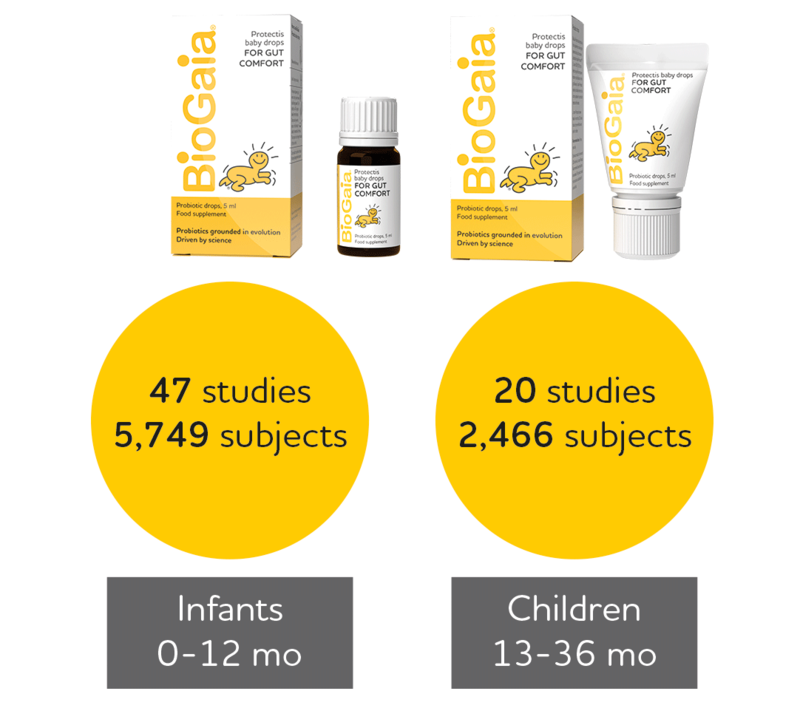 BioGaia’s probiotic products with Lactobacillus reuteri Protectis (L. reuteri DSM 17938) are among the most scientifically well-documented probiotics for children with regard to both efficacy and safety. BioGaia’s probiotic strain Lactobacillus reuteri Protectis has been used in 98 clinical studies in 11,971 children, from newborn to 18 years old (February 2019). The results indicate that Lactobacillus reuteri Protectis may help in functional gastrointestinal disorders such as colic, regurgitation, constipation and functional abdominal pain. The newborn infant establishes its gut bacteria and intestinal microbiota from birth and during the first three years of life. Directly after birth the newborn baby is almost sterile but very soon bacteria start to colonize every part of the body – the skin, the mouth and most importantly the gastrointestinal tract. The number and diversity of bacteria continue to increase until the age of three. At that time the microbiota resembles the composition of an adult and then, more or less, remains the same throughout life. The interest in gut bacteria and the infant’s microbiota has exploded in recent years and research has shown that the infant microbiota plays an essential role in human health. A diverse microbiota may help the infant to optimize the development of the gastrointestinal tract and contribute to better health later in life. BioGaia's probiotic products with Lactobacillus reuteri are suitable for the whole family. Lactobacillus reuteri is one of few bacteria that has co-evolved with humans since the beginning of time, and because of that it is adapted to its host. Today we know that bacteria are generally beneficial and together with other microorganisms vital to our health.